From here and my twitter feed (what, you don't follow me? ), I think it's clear I've been thinking about sci-fi lately. I've also been getting, dare I say it, a little bored with swords & sorcery lately. For three and a half years it's been most of what I read. So, I'm moving on for now. I'll probably get back to S&S, and I'll definitely keep my eye open for good historical novels, but for now I'm going back to my first genre love: science fiction. Until last Friday, I wasn't sure what book I'd kick things off with. I was halfway through C.J. 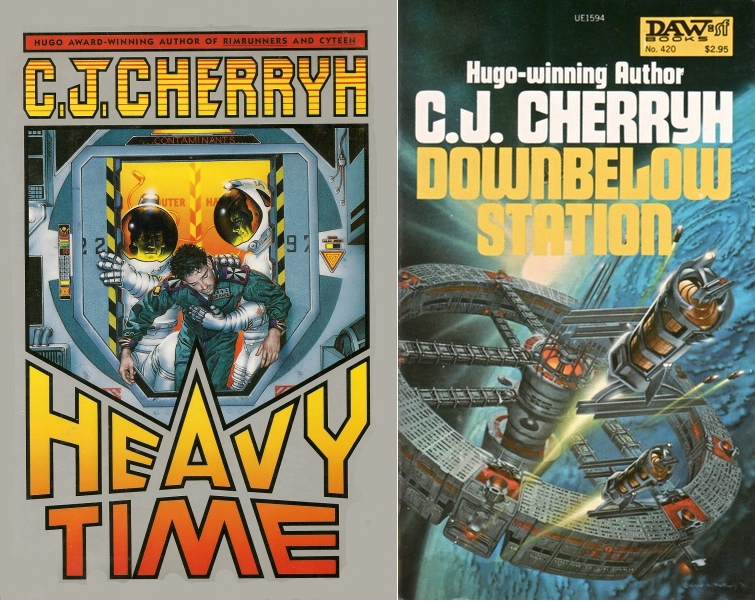 Cherryh's Heavy Time (1992) and H. Beam Piper's Space Viking (1963), plus I'd started Hal Clement's foundational hard sci-fi book, Mission of Gravity (1954). Cherryh's book is better written and more complex, but Piper's focus on societal collapse and the rise of barbarism, both cultural and of the sword-swinging, semi-literate type fit right in with some other things I'm reading now (Rod Dreher's The Benedict Option, this interview with Paul Kingsnorth about the Dark Mountain Project, and Jim Cornelius' provocative post Resist!). So, Space Viking it was. It went live over at Black Gate this morning. The first book I read by Piper was Little Fuzzy in 1984. I'd seen the title praised in Analog and in the Peter Nicholls' original Encylopedia of Science Fiction. 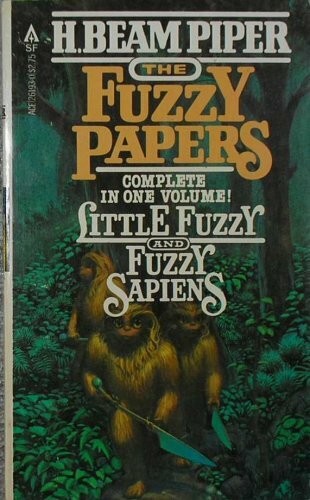 When I saw the omnibus edition of Little Fuzzy and Fuzzy Sapiens, I grabbed it. It's been a very long time since I read it last, but I remember being caught up by Piper's story of cute critters and a crusty old prospector at once. Hell, even when it turned into a courtroom drama, the book didn't let me go. As soon as I was done, I started right in on Fuzzy Sapiens. 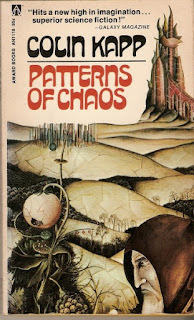 Then I set about finding the rest of Piper's Terro-Human Future History books (for whatever reason, I never latched on to the Lord Kalvan Para-time stories - but my dad did). 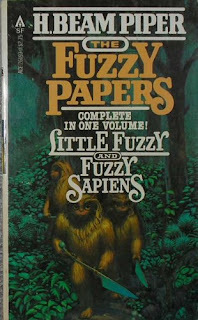 Later that year, the long-lost Fuzzies and Other People was published and I got a copy form the Science Fiction Book Club. 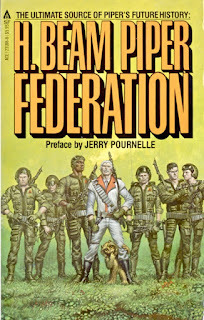 Over the next year, I read the two collections Federation and Empire, along with the novels Uller Uprising and The Cosmic Computer. They're all good, and it's a damn shame Piper took his life in 1964, when he clearly had more stories in him to tell. Piper's Future History is a pessimistic one. General civilization seems incapable of persevering. During the rise of the Terran Federation, bureaucracy and cultural decay are unavoidable hazards that set it to rot. During the galactic dark age following its collapse, the beacon of technological survival, the Sword Worlds, are murderous raiders who slaughter and rob any weaker world they encounter. In the end, order and stability can only be imposed with strength from above as exemplified by the birth of the Galactic Empire. The difference between Piper's dark ages and empires and, say, Asimov's, is that Piper isn't just using about them to tell a cool story. Though he wrote in solid, pulp space opera-style, he was really intent on exploring the fragility of human civilization. He doesn't do it with all that much complexity, but he does it well enough to give a deeper resonance to what might otherwise be just some more space opera adventures (albeit, very good ones). One of the things I was most impressed with in rereading Space Viking was Piper's his lack of faith in any type of government being able to fend off corruption and collapse. Sure, he makes fun of liberalism and social worker-types, but he knows the other side is just as prone to taking every advantage of the situation to line their own pockets. Few people anywhere are ready to take the long view and do the real dirty work of building and maintaining civilization. The other thing that impressed me was how freakin' cool the action is. The space battles are something else, with squadrons firing missiles at each other across from a thousand miles apart, then closing in on each other to let loose with volleys of kinetic guns. They would look killer on screen. 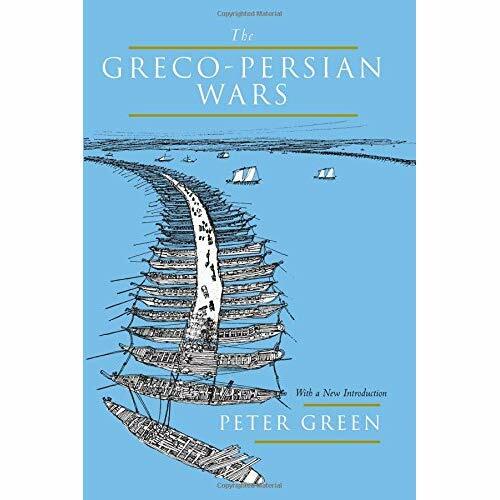 I also loved the logistics involved in the reestablishment of trade and civilization on the edge of the old Federation. Discounting the wish-fulfillment of hyperspace travel, Piper makes interstellar trade and expansion seem believable. As much as the book's hero, Lucas Trask, I found myself getting swept up in the building of schools, bringing education to the barbarians, and figuring out what will help reignite society best. I know I will be reading more Piper in the coming months. Right now I'm in the middle of his oft-anthologized story, "Omnilingual." I'm definitely going to read Little Fuzzy, and probably The Cosmic Computer. If you haven't read anything by Piper, I'll repeat what I say in my review: pickup Little Fuzzy or Federation and give 'em a go. 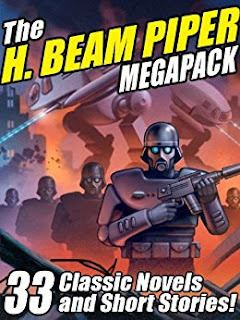 For 99¢ you can get most of his work in Wild Side Press' H. Beam Piper Megapack. Trust me, it's a worthwhile investment. Without my dad, my tastes in science fiction and fantasy wouldn't be what they are. 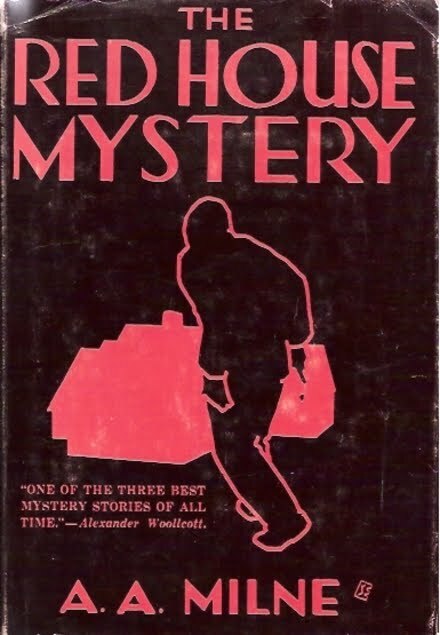 It was he who had boxes of paperbacks in the attic filled with Poul Anderson, Gordon Dickson, Fred Saberhagen, and the like. They were added to constantly as he snagged new books at the Staten Island Ferry Terminal in Manhattan or Waldenbooks. Together we took regular trips to local used bookstores, where he'd usually pick up an armful of books. The thing is, as I grew up, our tastes diverged. Not completely, but significantly. Since he read so much, finishing several books a week, he deplenish his stock of new stuff and turn back and reread certain old ones over and over again. These are the ones I know he read at least five times or more. 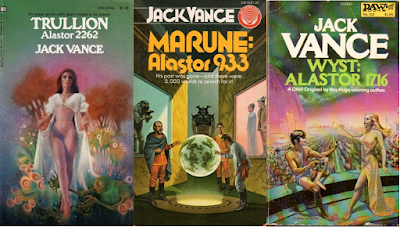 I never read Roland Green's Wandor or Vance's Alastor Cluster books. 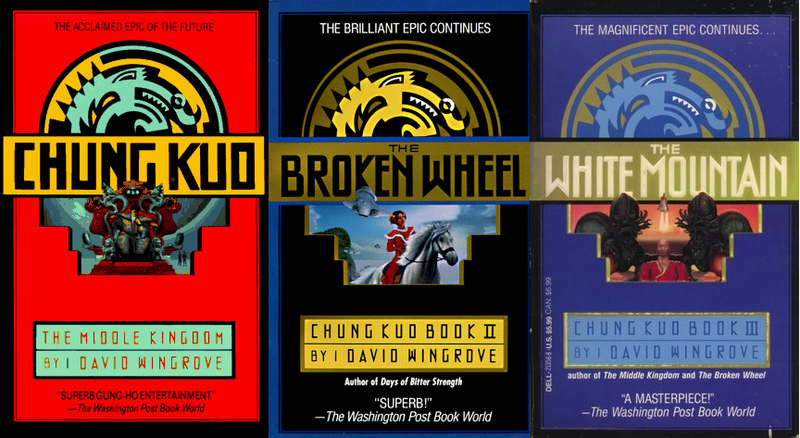 For some inexplicable reason the Wandor books looked to cheesy. I mean, when he brought those home, there wasn't much heroic fantasy he brought home that I just did pick up when he was done. I have no idea whatsover I saw in these that made me not do that. The little bit I've found out about them, they sound like they're filled with carboard characters and a list of plot coupons to punched and foozles to be defeated. As for the Vance books, well, I've got no excuse. Somehow, I never found the time for them despite all together they don't break 650 pages. Sheesh. My memories of the Stasheff and Lanier books are fond, but I suspect there's a heavy blanket of nostalgia laid over them. 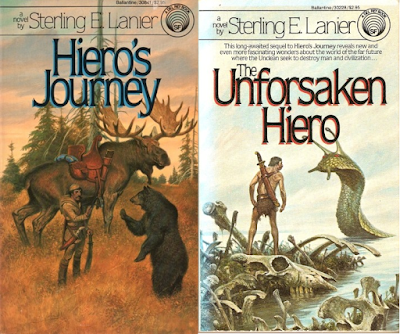 The Stasheff series eventually topped out at a dozen books, but I never read any mention of them anymore. They're humorous stories of a secret agent landing on a planet with a medieval tech level and magic. I'd be willing to reread the first one, but probably no more than that. 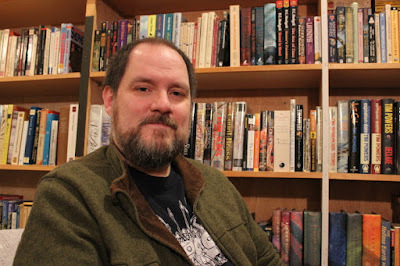 Lanier's books, with psionic heroes, mutants animals, secret societies, and deadly, atom-spawned abominations was the primary source for TSR's GAMMA WORLD. I've read some negative reviews recently, but I'm still tempted to go back to them. Patterns of Chaos was solid, pulp fun. A man with no memories finds himself on a planet targeted for destruction by "hell-burner" missles. Then people start talking to him in his head. I'd love to find my dad's copy and give it a go. I think he might have reread this a dozen times of more. Finally, a book that looks way cooler than any memory I have of it. I think The Yngling is about a Scandinavian warrior in a post-apocalyptic world saving the day. There were several sequels and I know my dad read them as well, if not as often. As a kid I found it lackluster and would be hard-pressed to think about revisiting it. My dad liked his sci-fi and fantasy boisterous and pulpy. He saved contemplation for when he read history. I first read Karl Edward Wagner and Robert E. Howard because of him. Same for Tolkien. Early Jack Williamson and Edmond Hamilton came to me via those boxes in the attic as well. If a book was too soft-sciency or grungy or whatever, he probably wasn't going to bother with it. 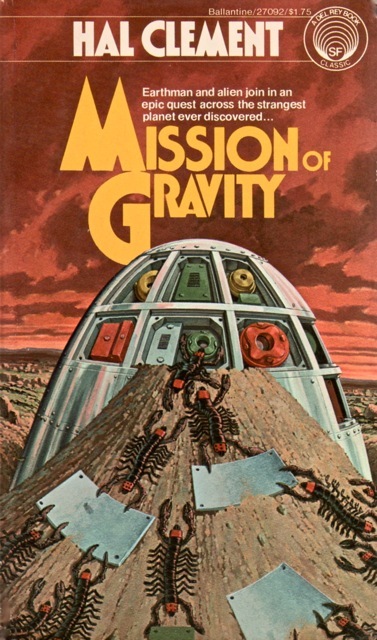 Early on, I fell in love with Clifford D. Simak's stories, but they never caught my dad. 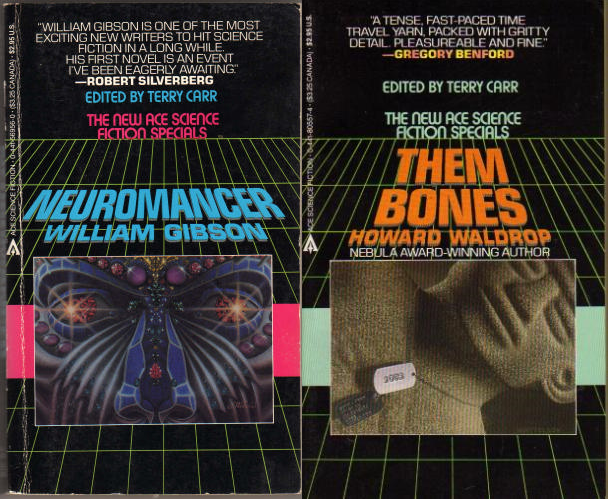 I don't think he finished William Gibson's Neuromancer of Howard Waldrop's Them Bones when I suggested he read them. On the other hand, he became enthralled by David Wingrove's bizarre Chung Kuo series. Whatever the case, if the local librarian Ms. Herz really made me a reader, it was my dad who made me a reader of sci-fi and fantasy. It's one of the many things I'm eternally grateful to my dad for. I've been living in a sick house the past few days, so I didn't get to my review of M. John Harrison's Viriconium Nights for Tuesday. Heck, I didn't even finish the book. But wait, you're not starved of new insights from me this week. Some time ago, Joe Bonadonna, asked if he could interview me. I said yes, and today, in lieu of Viriconium Nights, John O'Neill posted it at Black Gate. Read or not as you wish. I reread it this morning and it was like hearing a recording of my own voice: irritating. Maybe if it was a live interview instead of one by email where I had a chance to go back over my answers again and again it would sound more like how I think I sound. Maybe if I had gotten Hallie to edit it it wouldn't be filled with mistakes. I think it's pretty clear what she brings to the table: logic and eliminates needless repetition. You know, important things. Tonal qualities of the interview aside, I'm proud of that picture Hallie took for it. Without any forethought, I sat in a place where you can see books by P.C. Hodgell, Raphael Ordoñez, Teresa Edgerton, Mervyn Peake, Michael Moorcock, and Tim Powers. That wide range of authors says more about my taste in fantasy reading than anything I managed to say in the interview. 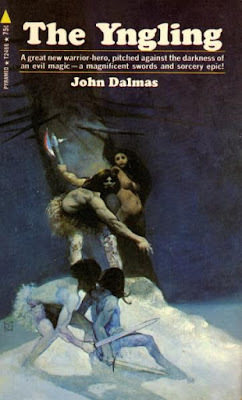 I absolutely love the covers I'm assuming John O'Neill added. As I tweeted to David West this morning, "All I sent Joe was that picture of my ugly mug." 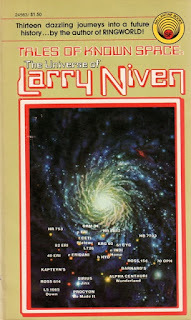 Those covers, especially for the Larry Niven books, are stamped on my brain. John picked the exact editions I originally read. Few things say SCIENCE FICTION! 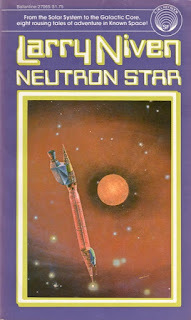 to me like Rick Sternbach's covers for Tales of Known Space and Neutron Star. As I answered the questions, an interesting thing occurred to me when I reached the one about my favorite characters. 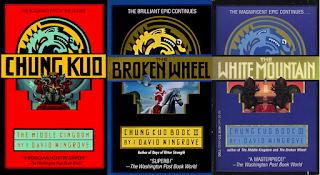 None of them were from heroic fantasy. 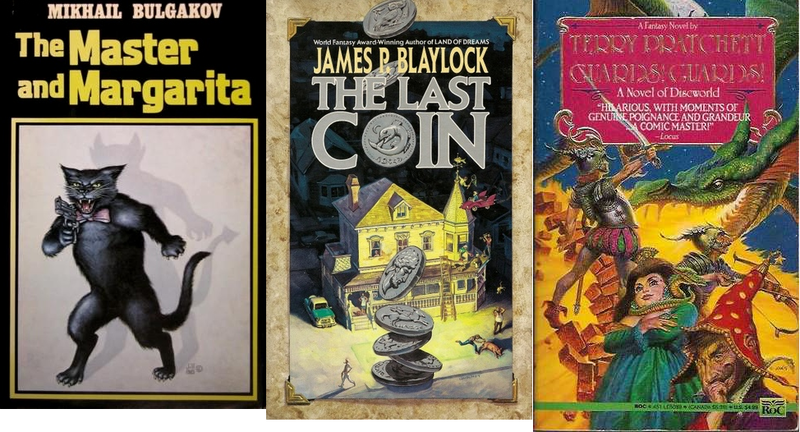 The Master and Margarita is literary fantasy, The Last Coin is contemporary fantasy, and Guards! Guards! (the first Vimes book) is a satire of fantasy. I love S&S, but it's clearly not what's effected me the most. The funny thing is, since I've been writing for Black Gate, it's almost all I've read. 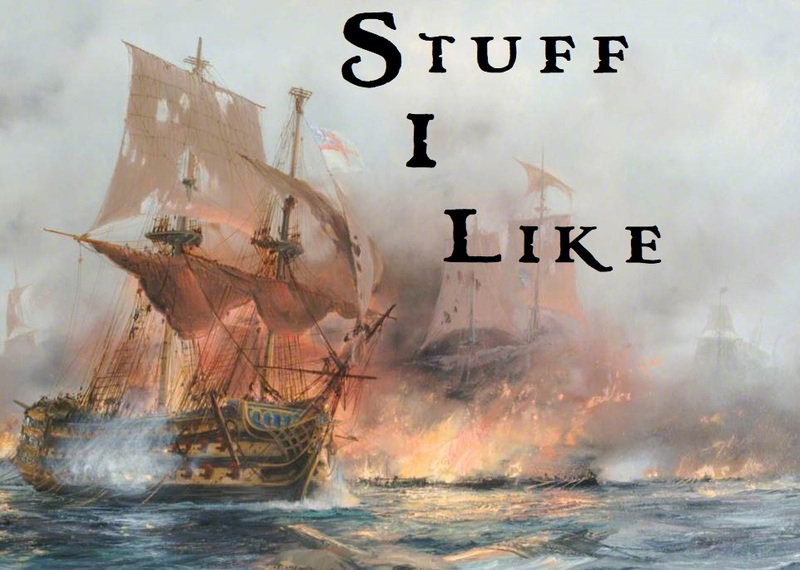 Obviously, I love S&S and its associated genres, but I'm just realizing how much reviewing it weekly has pushed out so many other types of books from my life. I don't like that. 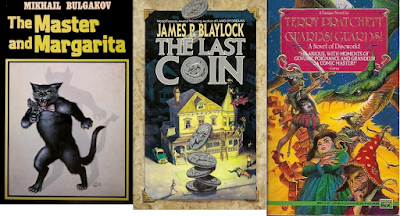 I own but haven't read the last two books by Tim Powers and the last three by James Blaylock. My goal of working my way through a stack of 19th century Russian books has long fallen by the wayside, broken under the weight of heroic fantasy. I've got to get back on track reading outside S&S. The biggest change in my reading habits over the past decade is how little science fiction I now read. For a very long time, I read far more sf than fantasy. 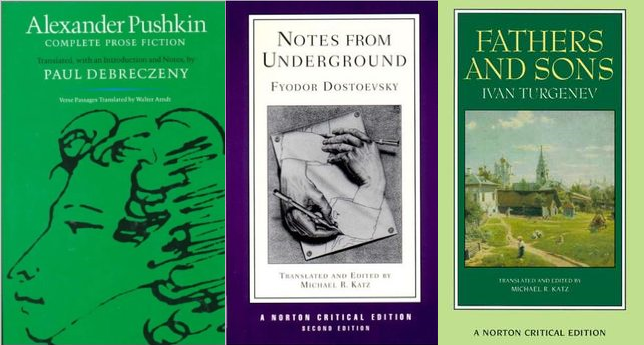 For years, it formed the bulk of my reading. In grade and high school the number of non-sci fi books I read paled in comparison. And then about ten years ago I just sort abandoned it. I stopped reading science fiction when it got dull. There were plenty of good books out there. 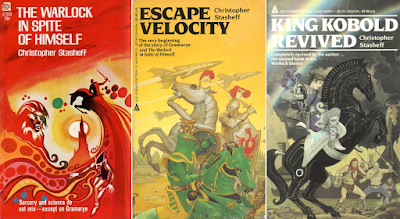 Vernor Vinge, Robert Charles Wilson, Iain Banks, and others were still writing good and powerful stories, but much of what I found bored me. Even those writers lost some of their appeal for me. Part of it is that sense of wonder I used to get from reading science fiction seemed reduced or even lost. This idea first came up in a conversation over on Keith West's site the other day and I think it's an important insight. 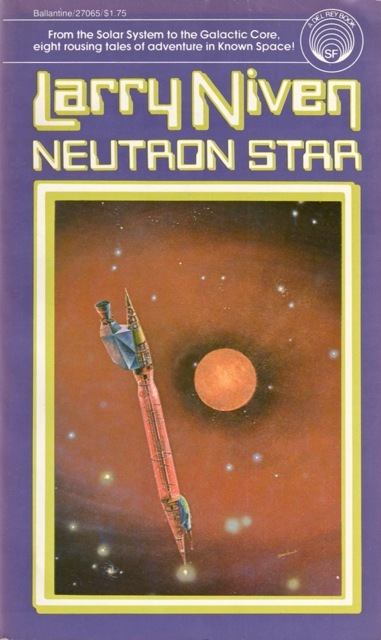 I was older and had read a ton of sci fi and had a better understanding of real science. Keith suggests sf is like a drug and you become inured to its high over years of exposure. 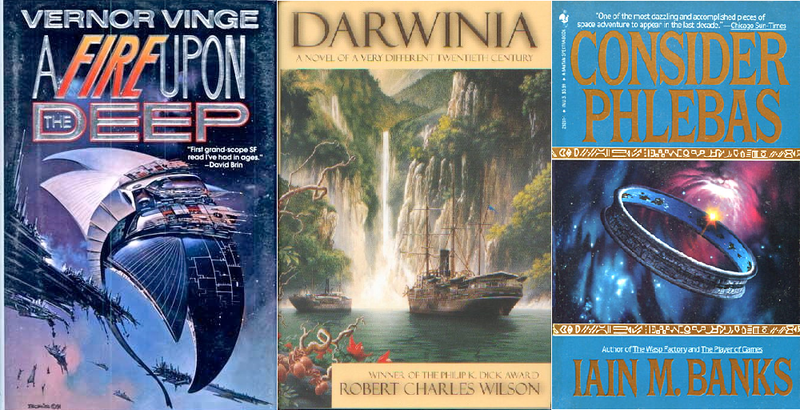 The books pictured above feature "science" that's so advanced that they're almost fantasy. I think, without ever consciously realizing it, that's why I turned more and more to pure fantasy. I could still approach a story with a "sense of wonder" and didn't need to get distracted by the author's sciencing to rationalize the craziness. It's easy for my "sense of wonder" to be triggered by fantasy and pure pulp-type sci-fi. Maybe a need to scratch that itch drove me to those genres. In addition to big idea sci-fi, I read a lot of low-tech stuff with space opera overtones such as Gordon Dickson, Poul Anderson, and CJ Cherryh. After a while, those stories can start to get a little samey-samey. I took a break from them, and the next thing I knew it was ten years later. It wasn't just a lost sense of wonder, though. If the sci-fi from my younger days (especially by Americans) was more libertarian and conservative, it became increasingly left-wing in the nineties and beyond. Now, that's not necessarily a problem. Fred Pohl, Mack Reynolds, Ursual K. LeGuin all wrote left-wing science fiction and that didn't stop me from reading them. But they were part of a large, diverse sci-fi community of writers whose politics ran all over the place. 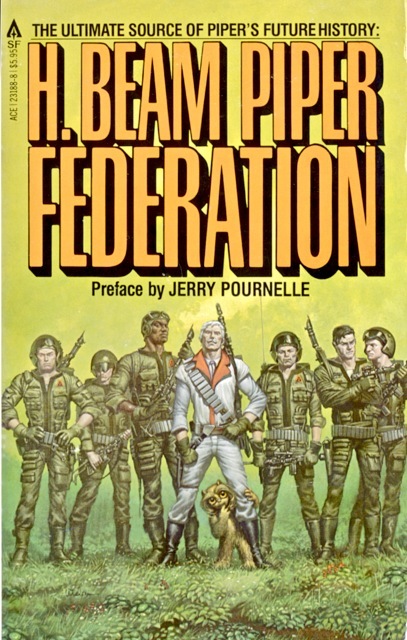 Some time in the last twenty years, it seemed like the voices of writers not on the left were being marginalized (or only published by Baen). I'm conservative in all aspects of my life with a healthy distrust of the bureaucratic state and centralized authority. I'm also not a fool, and know better than to put my faith in corporations either. 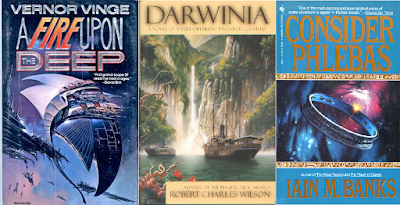 Much of the science fiction I grew up with tended to align with my views. 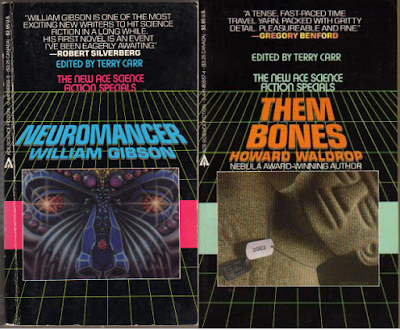 Anderson, Dickson, Niven, and Pournelle explored libertarian themes in their stories at times. It wasn't all they did, though. They made sure to tell stories that were thwacking good adventures and provoked you to think about the future of humanity. 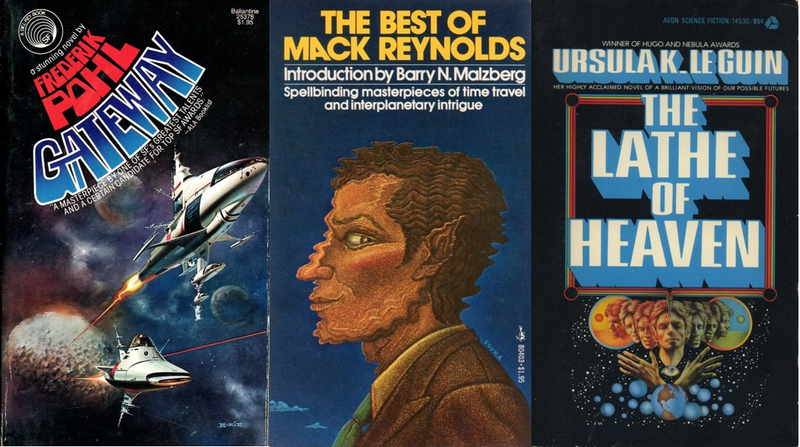 Too many new stories I found seemed to exist only as "correctives" about the previous eras of science fiction. 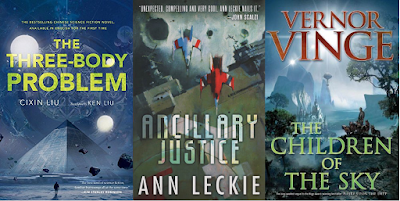 I yearn for more voices and perspectives in sci fi because it offers the potential for new vistas, new ideas, and new types of stories and storytelling. Hell, there's always a place for addressing past assumptions and perceived flaws. If all you're doing is writing in response to what's come before, and not telling those new stories, though, it gets boring. It seemed intent on going on about the problems of the real world to the exclusion of any sense of wonder or exploration. At some point it turned into nothing but lecturing. Coupled with the lecturing was what seemed to be a blanket dismissal of sci fi's past as sexist, racist, homophobic, and capitalist. I know I'm being too broad and too ready to take offense (though reading the comments from some folks on the left during the Puppy Wars were pretty offensive to anyone not explicitly on their side. You can't convince me of your arguments if you act like a tool), but I don't care. The past of science fiction was a hell of a lot more than it's dismissively portrayed as being. When people, who often haven't even read the books they're condemning, dismiss a lot of what you like, it gets tiresome and you don't want to play anymore. I can't be alone. It's not that politics haven't worked their way into fantasy, but the field has managed to remain more open to diverse opinions and perspectives than mainstream sci fi. Heroic fantasy in particular tends to be a more libertarian genre to start with, telling the tales of lone warriors and adventurers living outside the rules of society. Maybe it's an unconscious reason I drifted toward it. Again, I'm not sure and haven't thought too much about it until now, but I'd wager that's part of it. Total book sales in the US have remained steady over the past decade, while those of sci fi and fantasy have dropped drastically. Part of it has to be tied to genre fans getting their fix from other media, but not all of it. Eventually, I stopped keeping up with the field and reading reviews. It's only the occasional big book like Cixin Liu's The Three Body Problem that breaks through to my awareness. I'm tempted to give Ann Leckie's Ancillary Justice a go, even if it does sound a little bit like an Iain Banks pastiche. 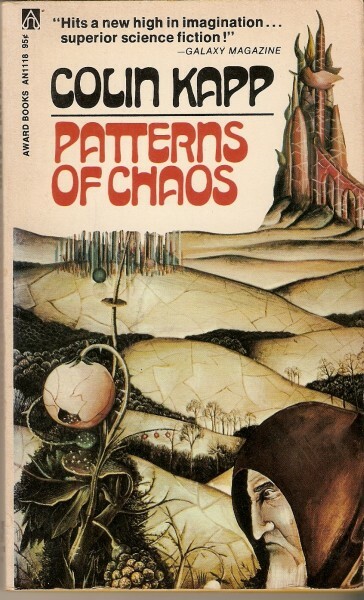 I also hope to get to Vernor Vinge's The Children of the Sky. 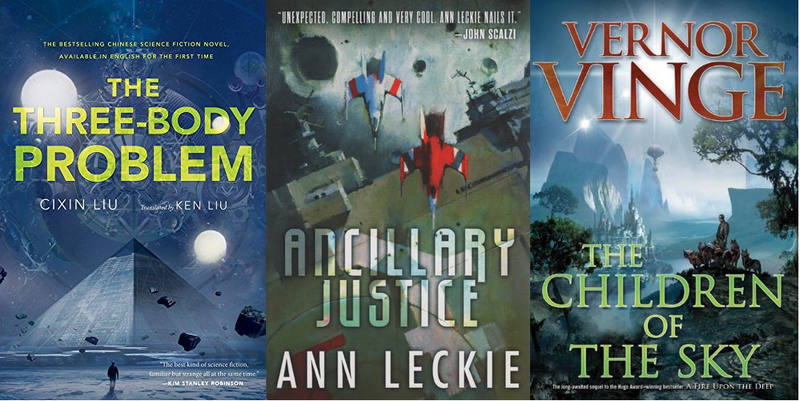 For the most part, though, I can't tell you what's new in sci fi anymore. As I'm writing this, my thoughts have gone back to some of the sci fi I loved best and I hear it calling me. It called me so loud the other night that I spent about an hour reading old reviews of CJ Cherryh's Alliance-Union books. It sparked a real desire to revisit some of the grittiest, most fast-paced sci fi I've ever read. I'm not sure where I'll start. 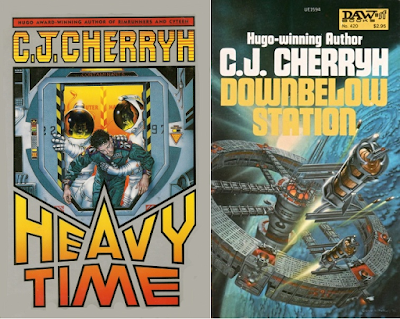 Maybe I'll pick up the first book in the series chronologically, Heavy Time, or jump to the earlier published Downbelow Station. After one of two of them, I think it'll be time to get back to the Russians. Oh, and I haven't forgotten my Western reviews. A few projects, including getting my house finished (almost done and only a year late), have derailed it the past week. I'm hoping to watch Ride Lonesome this weekend in between some serious reading and writing and let you all know what I think next week.